I read a number of Monica Hughes' books back in 1999 because she is the favorite author of a friend. Though some were harder to find, I enjoyed all I could lay my hands on. Her books have been translated into dozens of languages. This is an interesting little book about a society's attempt to make a perfect city - a city run by a computer, where the computer becomes the tyrant instead of man. The fight to save the city is lead by two friends, Caroline the computer designer's daughter and her friend David. This is a great book and I highly recommend it. I have reviewed a number of weight lifting, health and fitness books over the years. In part because of personal interest and in part because of my injury, and in part just because of who I am. I have a desire to get back in much better shape than I currently am. Author S. William Shaw has started a new website that looks like it will be amazing for the exercise enthusiast. 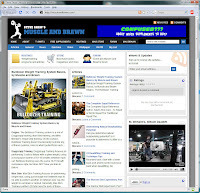 His new site Steve Shaw's Muscle and Brawn already has a wealth of information, news, articles and personal accounts. So If you're a casual lifter or an adept check it out you will probably find something useful. I read a number of Monica Hughes' books back in 1999 because she is the favorite author of a friend. Though some were harder to find, I enjoyed all I could lay my hands on. This is another wonderful book by Monica Hughes. It is about some Irish space tramps, Mike and Moira Flynn, a father and daughter and his attempts to swindle a backwater planet. He ends up leading the world with their pseudo god, the robot guardian. It was a wildly fun book to read and is part of the Isis cycle. Well worth tracking down for the young readers in your life. This was a moving Jewish Story. 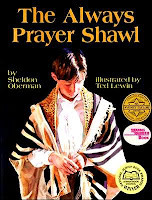 It is an amazing picture book about the changes and staying the same that is life in the Jewish world view. It is the story of a family prayer shawl that gets passed down from generation to generation, from grandfather to grandson. It is a powerful book about tradition, and family and the power of blessing and the traditional sense of inheritance. This was the second book I used to prepare for this exam. The first was Craig Zaker's. Both had advantages - both had disadvantages. The disadvantage of this is its shear volume. It has so much material (all of it good) but if you are working on a time line it is a lot to work through. This book presents extensive exam preparation materials, going through section by section the requirements of the exam. It will help you learn to think and answer in "Microsoft speak". There are lots of materials out there if you just want to pass a certification exam, crams, sims, testking … but if you really want to learn the materials, you need to work with it. 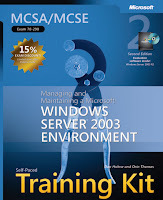 This book with its wide range and extensive exercises will help you learn hands on. It is an excellent resource, and will be a reference book I use for years to come. As I stated in an earlier review Zacker writes in a very accessible and easy-to-read manner. His prose is excellent and the way he presents his material makes it easier to learn and apply. 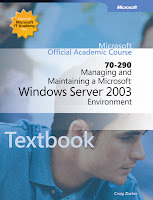 As such this was one of two books I used to prepare for and write the Microsoft exam 70-290. The other book I used was from Dan Holme and Orin Thomas. Both books had advantages and disadvantages. First, Zacker's book is much more compact, and gives you the quick and dirty. He hits the topics hard and fast. If you need to work through the material in the least amount of time, this is the book for you. Holme's and Thomas's book goes into much greater depth and specific exam preparation. Zacker presents his material in a clear and methodical manner. His writing style is fluid and easily accessible. He has a knack for presenting complicated material in a way that helps clear it up quickly. Judaism remains to the present day essentially a product of the bible as well as the period that followed the return of the Jewish Exiles from Babylon. God is: omnipotent, one & only God, beside whom there is no other; omnipresent; all knowing, all wise, omniscience, all holy transcendence. The human body is a sacred vessel comprehending the divine spark, the soul, and as such must be kept healthy, sound and clean. To neglect the body and its physical requirements is to offend against God. Moderation and sobriety, combined with cheerfulness and joy, constitute the key note of Judaism. The harmonization of the physical needs and moral and spiritual aspirations spells contentment. It is an excellent book for the scholar or just a lay student of religion. Every year I try to read a book or two about the Holocaust, not because I like to but because I think we need to. This book is great for the age group for which it was written. Written from a child's perspective and with a child's insight, it is different from many of the other first person accounts, in that aspect. Many that I have read are written with an adult voice or a looking back. In telling Ruth's story in her own words, it moves from event to event. It is not as raw and cutting as some of the other survivors' stories. Yet it captures her terror and life in a very moving way. I read most of the Earthsea Cycle as part of a children's literature course I did back in 1999. This is another book about Ged. But in this one he is the special educator to Lebanner/ Arren. It is a book about the big questions, such as life and death, and the search for who we are. It is also about what we are to be and the idea of predestination. Ged says "to seek to be one's self is rare." It is also that we seek what we don't know in order to be found by our destiny. In the book darkness is overtaking the world, singers are losing their songs, mages are forgetting their crafts. Men doubt and society is decaying, all because of fear or death. Men are giving up their true names to a lie. They are becoming slaves to a dead master. Every now and then you come across a book that is so unique, so different, so incredible that you just want to share it with everyone you know. This is one of those books. I read it three times in a week, and still want to go back over it again, in case I missed anything. What makes this book so incredible is that it is actually more than a book; it is a new entertainment experience. It is a book, it is a movie and it is fantastic. The story is told in two parts. It is the story of Ryan and Sarah, who live in Skeleton Creek Oregon. They become fascinated with the town's name, and the fact that it only changed to that recently. While investigating the mystery of the name, they find out about a ghost story of a man named Joe Bush who died in a mining dredge outside of town. While investigating the dredge, something strange happens and Ryan falls and breaks his leg. That is where our story begins. Ryan is in the hospital recovering and he starts to tell the story in his journal so he can make sense of it, and in case something happens to him. But the story is told by both Ryan and Sarah. Currently their parents will not allow them to see each other because they believe that it will encourage their investigative efforts. Yet the two are staying in contact over the web. Ryan is writing the story in his journal, which is our book, and Sarah is creating videos and posting them on her website www.sarahfincher.com. Combined they tell the story. It is a great new media/literary adventure. Even the packaging and presentation is new. The book comes in a sleeve like a cover on a new DVD that says: "Read the book … Watch the videos." Once you slide the book out, it looks like a hard cover journal, and it looks like it was hand-written. The journal has illustrations and, what appears to be items taped inside it. The only bad thing I can say about it is that it ends with a cliff-hanger and the conclusion, Ghost in the Machine - Skeleton Creek Book 2, is not due out until September 2009. This book has made my top ten all-time fiction list. It is a ghost story extraordinaire. So as the cover says, read the book and watch the videos - you will be drawn in and amazed by the story! This was a very interesting book. As I read it I felt like Toad was a 'Prodigal Son', who came back only far enough to receive acceptance, then returned to his bad habits till he was in trouble again. It reminded me much of myself, playing at being Christian before really giving Christ all areas of my life. Like Toad I would repent, but then not really change. Rat was wise and resourceful, Mole was tender and caring and awe-full like a child yet also very wise. Badger is like a wise mature old mentor or guide, sent to give direction, and lead one to find one's own purpose in life. Yet the mix of Animal and Human society just did not make sense to me. It felt like a badly planned Narnia novel. It did not explain how the animal and human worlds came to interact and share a language or culture. But over all it was a fun read even if dry in some spots. How far would you be willing to go to save a life? Because to be honest, it is something you might have the opportunity to do with very little time or discomfort to yourself. 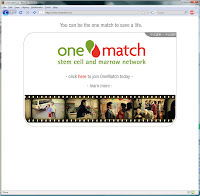 I am talking about donating stem cells or bone marrow through the new Canadian One Match Network. Back in the summer of 2007 I had the opportunity to donate through the then Unrelated Bone Marrow Donor Registry (UBMDR) which has now been rebranded as One Match. That experience was chronicled in a three part series for Imprint, and this is now an update. By following a few simple and easy steps your type can be catalogued, A. B, AB, and O). Your blood has certain characteristics that they are looking to match so that you could be a possible donor. The characteristics are called Human Leukocyte Antigens (HLA) - they are DNA markers. These antigens are found on the surface of the white blood cells. Now some antigens are more common in specific ethnic groups so it is important to have as many people in the registry as possible. One of the reasons for the rebranding of the registry from UBMDR to One Match is a focus on the need for more ethnic representation on the registry. The registry is also eager to attract young donors because generally they are in good health, and are associated with better long-term survival rates for recipients and they can stay on the registry for a longer length of time. You can only join the registry if you are between 17-50 years of age. You can donate up to the age of 60. You should consider joining the registry because each year hundreds of Canadians are in need of a bone marrow or stem cell transplant, which for many of these patients, is their only hope for recovery from illness. You might be able to help! What does it take for you to help? All it will take is a bit of your time. Call 1-800-2-DONATE or go to www.onematch.ca and a new testing procedure that only requires a mouth swab, will be sent to you with return postage, and you could join the registry. That, combined with a willingness to donate either bone marrow or peripheral blood stem cells, and you might have the chance to save a life. Currently there are about 220,000 Canadians who have made this commitment, and over 11 million people worldwide are on the registries. A year after my donation I had the opportunity to exchange emails with the recipient. Here is some of what Guy had to say. How long were you on the registry waiting for a match? How long between when you had a match and the procedure took place? I had to go through five chemotherapy treatments before thinking about transplant. Then, I was in remission for 18 months. When cancer came back, in March 2007 I had another treatment to stop the progression and a last one, just before the transplant, in May 2007, to kill my bone marrow. How has receiving the stem cells affected your life? For about one year I had many physical restrictions because I did not have an immune system. For example: when I wanted to go to the grocery I had to wear a special mask to protect myself and wash my hands as soon as I came home. I also had many restrictions regarding food. I was in danger because my immune system was really low. Emotionally speaking, it was hard because the doctors gave me a 65% possibility of failure, meaning death and only a 35% chance of getting through. My girlfriend and I decided to focus on the meaning of the gesture of receiving a new life instead of the possibility of losing it. We cried, we laughed, we hugged and then I had to take a nap because I was drained. What did the preparation and procedure entail? Like I said before, they have to kill my own bone marrow before giving me somebody else's. The whole procedure took around 60 days, hospitalized with no immune system and the danger of many infections and complications. Are you willing to share what condition you had that required this procedure? Do you know anyone currently waiting for a match? No, but I knew a 24 years old guy who passed away waiting for one. As can be seen from this brief conversation in translation, for a mere few hours prep and a few days discomfort you can have the opportunity to change a life forever, and not only the life of the recipient but also of their friends and family. So while you are here at the University of Waterloo consider joining the network, even if you never have a match, being willing to makes you a hero. Note: This is a continuation of a three part series from last year. Supposedly this is the last novel of Earthsea, or at least that is what the book jacket says at its time of printing in 1999. This book is set after Tehanu, or at least after some of its events. However it is a strange story. It is about dragons and man, and how they are but two sides of the same race. In it, Iraina a young girl from Irania, travels to Roke to study as a mage. This causes a split among the masters, five to four against her. There is even the threat of violence among the master mages. In the final confrontation on Roke Hill she kills the master summoner, or returns him to death and turns momentarily into a dragon. She says she will return if they ask her. But she intends to go further west to her people, to the dragons, to find out who she is and the rest of her true name. Again this story leaves the Earthsea Cycle incomplete, unfinished. This book continues right from the end of The Furthest Shore. The story is slower then the other three, yet it is also much deeper. The primary themes again are being: who are we? Especially who are we after loss? For Tenar/Ghoa it is the loss of husband; for Ged the loss of power, ceasing to be a mage. Also it is man's struggle to conquer death. We also learn in this book that in earthsea, man and dragons were once one race. Men are the children of dragons that horded and built fortresses and forgot how to fly. Therru is an adopted child of Tenar and we find out that she is really the daughter of Kalessin the oldest of dragons. Yet we also find out that Kalessin is really Segoy the creator of earthsea. Segoy leaves his daughter with Ged and Tenar saying he will one day be given a child by them.